When Temple Grandin (played by Claire Danes) travels to her aunt’s ranch, it does not take us long to realize that she responds to the world in a unique way. Her aunt, however, is up to the challenge of having Temple on the ranch for a summer, and Temple grows to love the ranch cows, identify with them, and learn from them. Without histrionics, this biopic shows some of the difficulties faced by those with autism as well as the immense love and understanding that Temple was given. Temple, an autistic girl whose childhood doctor suggested that she be institutionalized, was blessed with a loving and determined mother who worked with her constantly, insisted on manners, sent her to schools, and always tried to stretch her. Her aunt and a gifted teacher also contributed immeasurably. With their support and her own iron determination, the little girl who was not expected to speak became a world expert on humane animal handling, a professor, and an autism speaker. Throughout the movie, we watch Temple search for relief from stress, deal with the pain caused by mockery and misunderstanding, learn science, and study animals. We see her determination and meet the caring relatives, friends, and teachers who support her along the way. And we rejoice and cry with them when Temple overcomes huge odds . 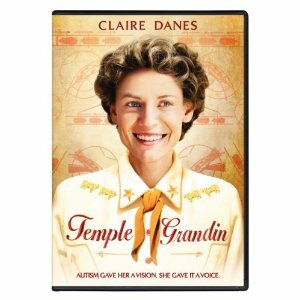 Temple Grandin is a life-changing and award-winning biopic about autism, perception, science, animals, and relationships. Recommended for ages 10 and up. For more about autism from Dr. Temple Grandin’s point of view, check out the many books she has written on the subject. This is the kind of resource I would recommend for your teen’s science and math reading. Disclosure: We were given this DVD by friends. Posted in: Reviews, Reviews: Movies.